The KONG Cat Bat-A-Bout Flicker Firefly is a light-up toy for cats. The flashing lights will quickly get your cat's attention. This toy is fun for use in the day, but even better in the dark. Let the hunting begin! 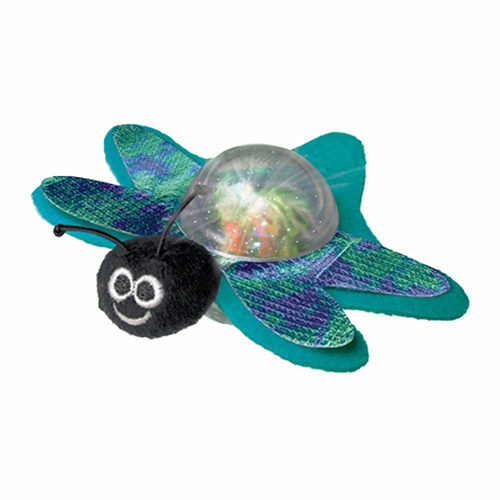 The KONG Cat Bat-A-Bout Flicker Firefly is a light-up toy for cats. The toy looks like a firefly. The centre of the firefly contains a ball with a flashing led light. The wings are made of felt with a print. This makes the light reflect even better on the wings. This stimulates the hunting instinct in your cat. Have you used KONG Cat Bat-A-Bout - Flicker Firefly before? Let us know what you think about this product.